Off the back of a General Election campaign that confounded expectations, the 2017 Labour Conference saw the Labour Party confident, united and realistically talking of being the ‘Government-in-waiting’, in sharp contrast to the previous two conferences under Jeremy Corbyn. After years on the side lines, the left-wing of the party has strengthened its reins over the party and its radical policy programme, Corbyn argued, was now the centre ground and part of the “political mainstream”. Our team on the ground took part in busy, lively fringe events away from the main conference hall, many of which were standing room only; witnessed many chants of ‘Oh Jeremy Corbyn’ from energetic young party members, as well as on the main conference podium; listened to contributions from ordinary party members on the main conference stage; and got caught up in a noisy licensed taxi protest against Uber, as the local Council reviews Uber’s licence later in the year. Ongoing rows about antisemitism and free speech, and differences over Brexit meant it was not all plan sailing. Nevertheless, conference this year was a buzzy, lively and united affair. Whilst the Party tried to save Brexit debates for a later date, as is often the case, if you look hard enough areas of difference were clearly visible. The delegate vote to exclude Brexit as one of the main areas of debate at conference was an area of contention. Several Labour MPs criticised the decision, accusing Labour of ‘ducking’ the key issue of the day, as Labour continues to navigate through a tricky policy area for the Party. In his big speech, Jeremy Corbyn called out the rifts in the top Tory ranks, saying the Conservatives are “more interested in posturing for personal advantage than in getting the best deal for Britain”. He backed May’s call for a two-year transition period, and claimed that only the Labour party can unite Leave and Remain voters. Yet, he offered precious little solid policy about the kind of final deal he wants for the UK, saying only that he would try for “unimpeded access” to the single market – an indication of the party’s continued struggle to offer voters a clear policy line. Elsewhere, business organisations, who were well represented at conference, were disappointed with a seeming lack of pro-enterprise and pro-business sentiment. Corbyn proudly branded Labour “a socialist party”, saying the “capitalist system still faces a crisis of legitimacy”, and now is the time for a new economic model. He called for the expansion of the public sector, the renationalisation of utilities, further investment in infrastructure and skills, and increased taxes for big businesses. The Labour leader said his party now stands “on the threshold of power”, because these policies are “what most people in our country actually want”. However, it was the issue of housing which was the central plank of this year’s Conference. The “chilling wreckage of Grenfell Tower” is a testament to the failed housing system in the UK, Corbyn said. He promised to introduce new rent controls in the private sector and to crackdown on gentrification projects. He said that too often what regeneration really means is “social cleansing, as private developers move in and tenants are moved out”. Under a Labour government, any redevelopment of a housing estate would have to be backed by a ballot of residents, Corbyn promised. With big policy announcements on traditional left-wing issues setting the agenda, tech unsurprisingly was not of the main policy priorities at conference. That said, several fringe events debated important topics, including cyber security, consumer protection, self-employment and the gig economy and an industrial strategy for the Digital Economy. Unsurprisingly, there remains significant concerns within Labour about the disruptive effect of technology on the workforce and the economy. What is needed, Labour argue, is a Government that effectively manages these disruptive effects, focusing on skills, fairness and the public good. 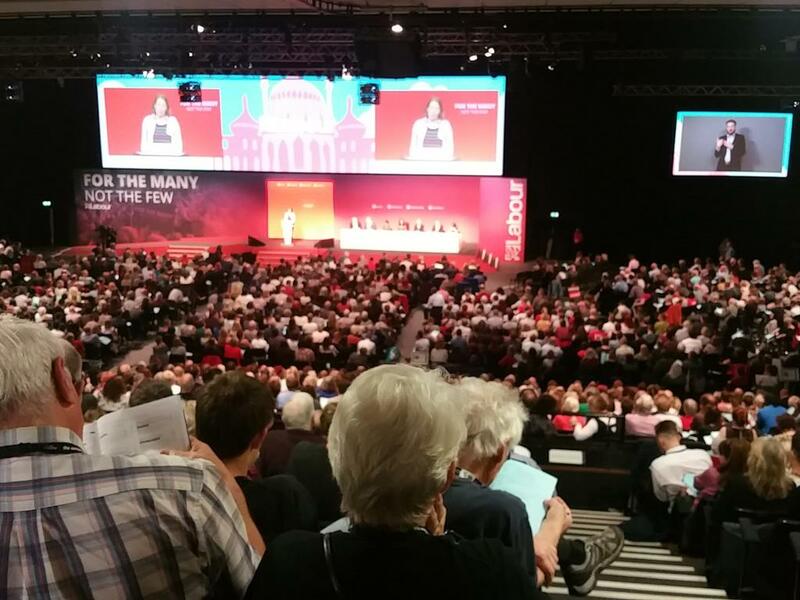 The NHS, a policy area which Labour traditionally poll strongly on, featured prominently throughout Conference. Shadow Health Secretary Jon Ashworth pledged to supply the health service with an emergency £500m ‘winter bailout fund’, stop the development of Sustainability and Transformation Plans and integrate health and social care. He also reiterated the party’s desire to scrap the Health and Social Care Act. The major announcements came from Shadow Chancellor John McDonnell who pledged to bring PFI contracts ‘back in-house’ and leader Jeremy Corbyn’s pledge to make everyone an organ donor unless they opt out. The central tenets of Labour’s energy policy have not changed since the election with a repeated vow to re-nationalise the country’s utilities and introduce a £250 billion ‘National Transformation Fund’ to build new infrastructure. Much of the Conference fringes focused on how industry and Government can work together to develop a smart energy system and harness innovation such as battery technologies. Various Shadow Ministers expressed their support for the development of a decentralised energy system and the falling cost of renewable energy deployment was also duly noted.